The 23-year-old artists's inaugural show, "Some Things Never Change," has restyled the imagery of people of color in L.A.
At 10:30 a.m. in Lora Schlesinger Gallery, Delfin Finley was already encircled by a crowd of women. As the indulgent conversation ended, the ladies giggled and walked away, elbows linked with one another. Delfin, young and handsome, stood tall with an invisible string hoisting his head. He comfortably transitioned into his next walkthrough at the gallery, with Edward Goldman and his Art Collectors. KCRW’s art critic for the last 30 years (and, full disclosure, this writer's boss), Edward was impressed with many things surrounding Delfin's work. First, and most obvious, was the artist's skill. Delfin has only been painting for four years and still pursues his Fine Arts degree in Pasadena. Second, Delfin is only 23-years-old, and this was his first solo exhibition. His detailed figurative portraits force the viewer to consider race and malaise from a young person's perspective. "For the basis of the show, I wanted to highlight being a person of color right now, and everything that comes with that, whether it's prejudice or racism or just feeling like the world's on your shoulders," Delfin told Edward's Art Gypsies. Finally, and perhaps the most unusual, was that on the opening night of his show, Delfin sold 80 percent of paintings, according to his gallerist, Lora Schlesinger. Within the week, he was sold-out. It might not come as a surprise to those who know some of Delfin’s instagrammable subjects—Tyler the Creator, Earl Sweatshirt, Na-Kel Smith—but in the art world, it's almost unheard of. The painter John Singer Sargent once said, "Every time I paint a portrait I lose a friend." That doesn't work for Delfin, who paints people he knows personally, either family or friends. This way, he's familiar with who they are and what they're about, he said. The secret to his hyper-realistic portraiture might be the extensive photoshoot he starts with his subjects. Without any preliminary sketching, Delfin works as a photographer from the onset, "where we just do poses, on poses, on poses." From hundreds of photos, he dwindles it down to a remaining three. "And then I try to dissect which would be the best from each one," he said. "Sometimes there will be an instance with a perfect pose, but they'll make a weird hand gesture." From there, Delfin manipulates the painting's narrative using Photoshop, replacing a hand or a facial expression. This is because Delfin is painting not just a person, but a history, like in the heroic, saintly portraits of his father. "With choosing my dad, that was the first painting made for the show," he said. In it, "he represents all men of color. He has the weight of the world on him. He doesn't know what to do at this point. He has the shovel in his hand because he doesn't know if he should raise it in defiance or help society prepare his grave." His father is Ron Finley, known internationally as the Gangsta Gardener, a South Central native who himself is no stranger to spotlighting civic injustices tethered to race in Los Angeles. "Before we took the photos, I told him what it was going to be about, the basis for the show, and what he was going to represent. He just said, 'Wow.' I did that with everyone. They had all that in mind, and I think that shows in their expression. They're thinking about all that's going on with their experiences," Delfin explained. It's possible that the artist's self-portrait—with a shadow and a noose—best depicts what it means to be young, non-white, and American in 2017. "The shadow is, I don't know where to go or what to do at this point," he said. "It's sort of like what I'm becoming: nothing. I put the noose above me because I'm sitting there, thinking about what's going on. I literally have my country's history hanging above my head, still. For the color scheme, I wanted it to be red, white, and blue." There is hope in Delfin, though, and it was the exhibition as a whole that spoke to the transformative power of art as dialogue and social change. Delfin's influences range from L.A. graffiti artists RETNA and El Mac to painterly heavy hitters like Kerry James Marshall and Kehinde Wiley. 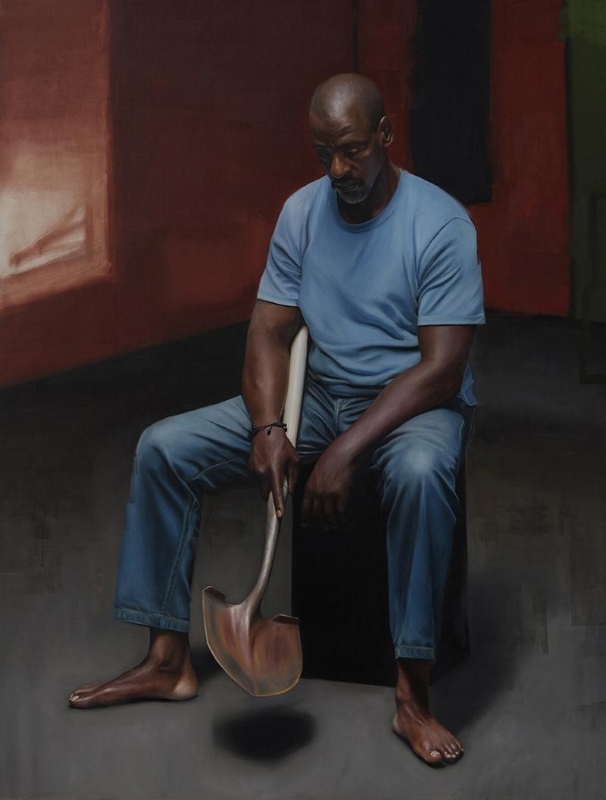 With Marshall and Wiley, "they kind of showed me this is possible, doing figurative work and being an African-American and that being the basis of what you're doing," he said. These artists have been champions of bringing portraits of black life into the art world. And for Delfin, that was the starting point. "I think there should just be more people of color in museums and big collections. You never really see people depicted that look like yourself or you and your family. Every time you see them, they're a servant or slave. I definitely want to be part of changing that." Maybe at Delfin's next solo show, his father will have figured out what to do with that shovel.